I was invited to guest post on the Original Eating site recently, and I wanted to share my recipe and the blog with you! Spring has sprung! The sun is shining and the birds are singing. It’s such a beautiful time of year here in Central California. It’s really my favorite time (but I think I say that about all the seasons). It’s still cool at night, but warms up nicely during the day, just lovely! Spring is definitely the time of new beginnings and it is for me also. I got married recently it hasn’t even been quite a year yet, so we are still newlyweds and it’s been a very exciting year! We’re having fun getting to know each other better as we settle into our married lives and one thing I know my hubby likes is sweets! (I call him my Sweetie and somehow that just seems to fit). I’ve really never been into sweets, but because I know it’s something he really enjoys so I’ve been trying to make them more. I’ve also been trying to make them healthier, but I won’t sacrifice flavor either. Sometimes that makes it tough. I was thinking about what I could make, a recipe to share and I thought of something my good friend Tracy makes and thought hmmm…. let’s just see what happens when we mix things up a bit! Here’s a fabulous new treat for you and it’s well…just full of yum! Here’s everything I started with; walnuts, apricots, vanilla, orange, cocoa powder, salt, honey and chocolate chips. That’s all you need to make this fabulous dessert! First I took a cup of walnuts, tossed them in the food processor and whirled them around. They were very finely chopped. Then after I assured myself they were as chopped as well as they could be, I gave them another pulse or two. Seriously, I did! 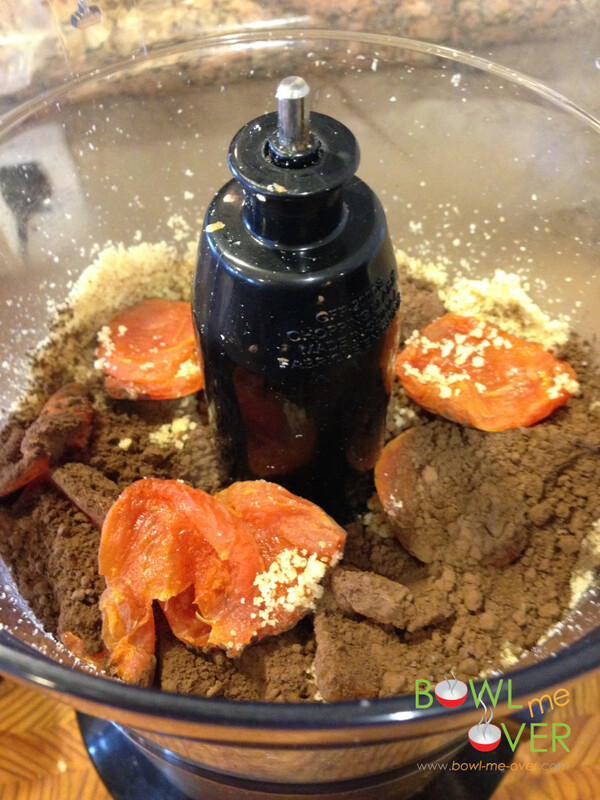 Then I added dried apricots, orange zest, salt and cocoa powder. Again I pulsed and whirled the food processor, chopping them as finely as I could. When they were completely chopped, I added honey, vanilla and fresh squeezed orange juice, one tablespoon at a time. You may not need all three tablespoons, it really depends on how much moisture is in the apricots. Test the dough, when you are able form the mixture into little squares, it’s nearly ready.This makes up the centers of the Chocolate Covered Apricot Bites. Transfer the mixture into a small bowl. Cover it with plastic wrap and tuck it into the refrigerator an hour. Use about one tablespoon for each bite and firmly press them together. Because of all the natural oils in the apricot and nuts, you’ll need to squeeze some oil out and that’s ok.
Just prep them into little squares like so. When you are done, put them back in the refrigerator for about two hours. They will harden up and be ready to be dipped into chocolate. Fast forward two hours and it’s time to melt the chocolate! Put a heat proof glass bowl over a pan of hot simmering water on the stove, (don’t let the bottom of the glass dish touch the water). 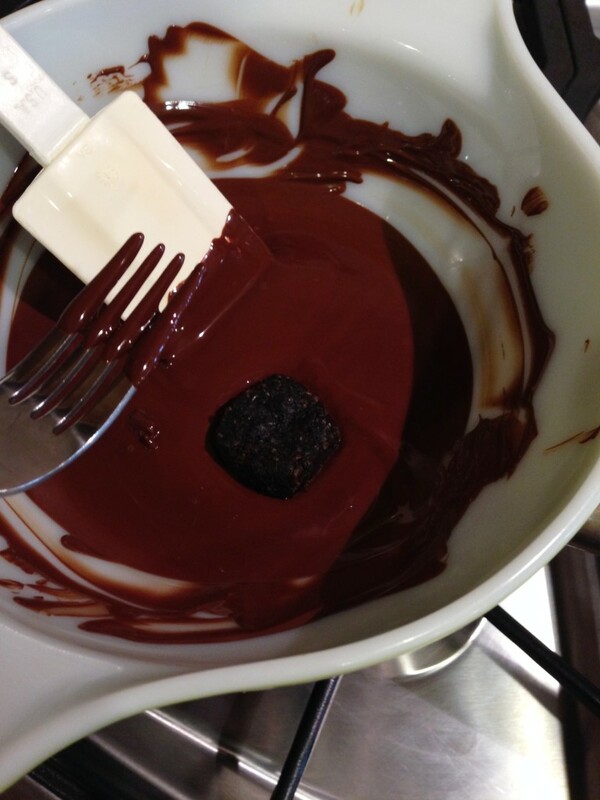 Add the chocolate chips and slowly stir to melt the chocolate until it becomes a smooth consistency. Remove it from the heat and now you’re ready to begin coating the apricot melts! Put them in the chocolate one at a time and use two forks to flip them over. Forks work really well because the excess chocolate will drain through the tines of the fork. Flip them over and coat them on all sides. 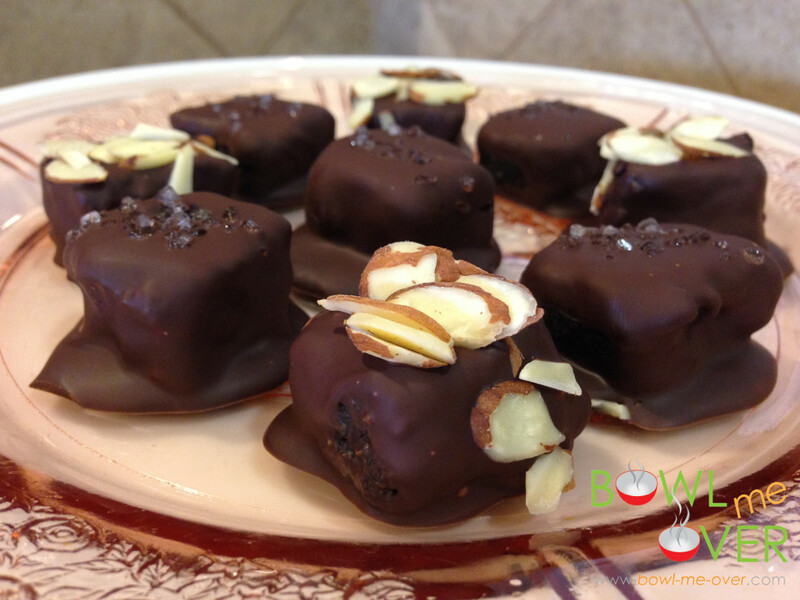 Place the Chocolate Covered Apricot Bites on a sheet of wax paper to harden. I took several pictures because let’s just face it they are pretty! Tuck them into the fridge when you’re done. My brother was here for taste testing and he decided their name should be UFO’s Unidentified Flavor Objects. When you’re tasting them you’re thinking what flavor is that? What am I trying? And my favorite comment he made was this is really good! If you want to (and I’d encourage it) decorate the top with sea salt or some sliced almonds. Personally, I prefer them topped with salt. 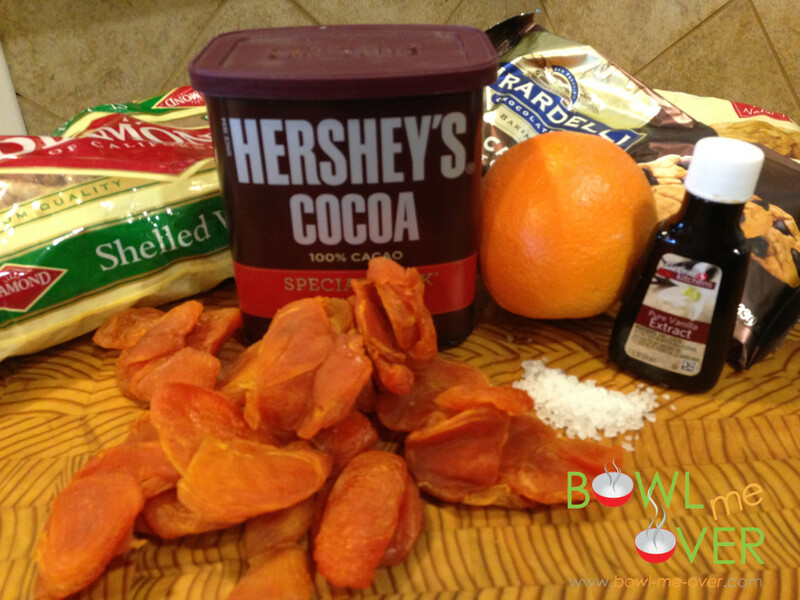 There’s something about the combination of chocolate, apricots and salt that makes them super delicious! Store them in the refrigerator. They absolutely melt in your mouth! 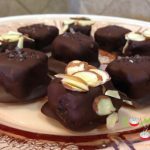 Chocolate Covered Apricot Bites - the perfect healthy sweet bites these are totally delicious and easy! 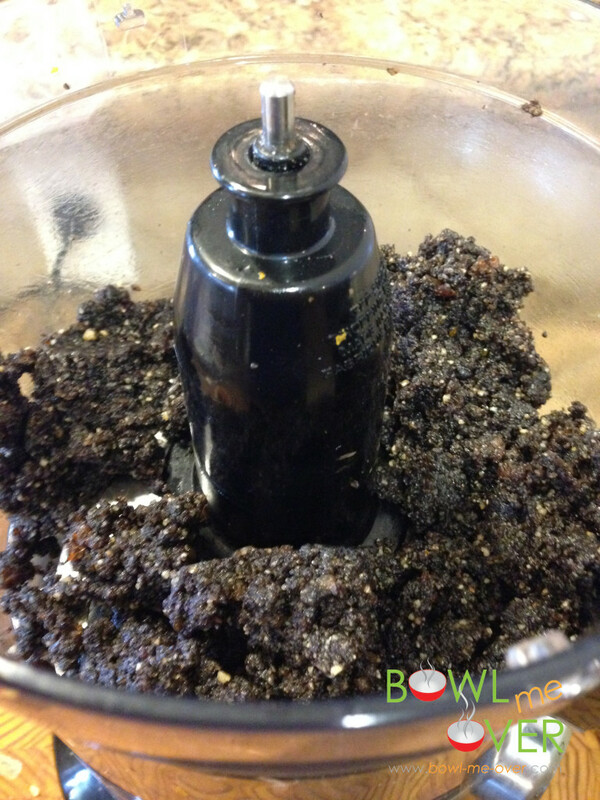 In a food processor blend the walnuts until they are a fine consistency (as fine as you can get them). Add the apricots, cocoa powder, orange zest and salt. Process again, pulsing the ingredients, chopping them very fine. Add honey, vanilla and 2 tablespoons fresh squeezed orange juice. Process again until all ingredients are completely incorporated. Test the dough for consistency. 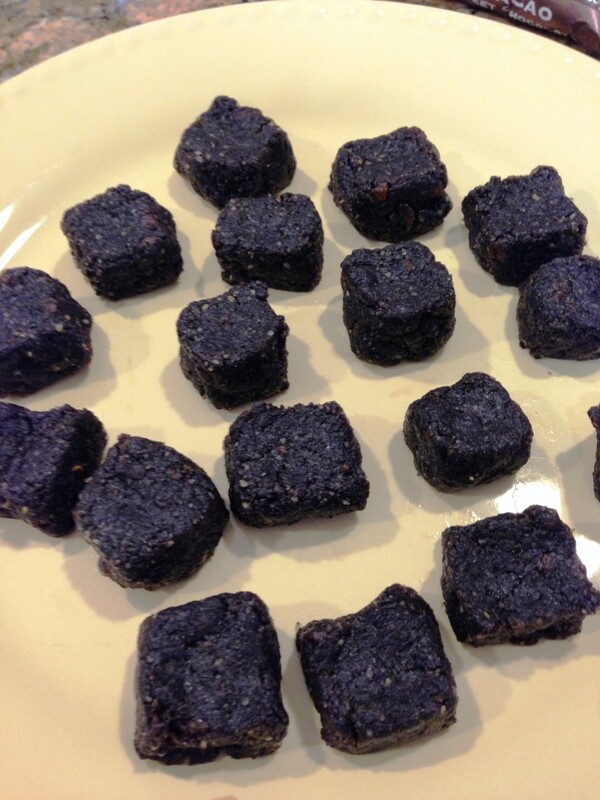 You need to be able to shape them into squares & have them keep their shape without crumbling. If there is not enough moisture, add another tablespoon of orange juice and process again. When the dough is the correct consistency, transfer to a bowl, cover with plastic wrap and refrigerate an hour. After refrigeration, shape the dough into small bite sized squares. Cover with plastic wrap and return to the refrigerator for two hours. To melt the chocolate, put a heat proof glass bowl over a pan of hot simmering water on the stove, (don't let the bottom of the glass dish touch the water). Add the chocolate chips and slowly stir to melt the chocolate until it becomes a smooth consistency. Remove it from the heat. Carefully drop the bites into the chocolate mixture, coating on all sides. Remove and transfer to wax paper. 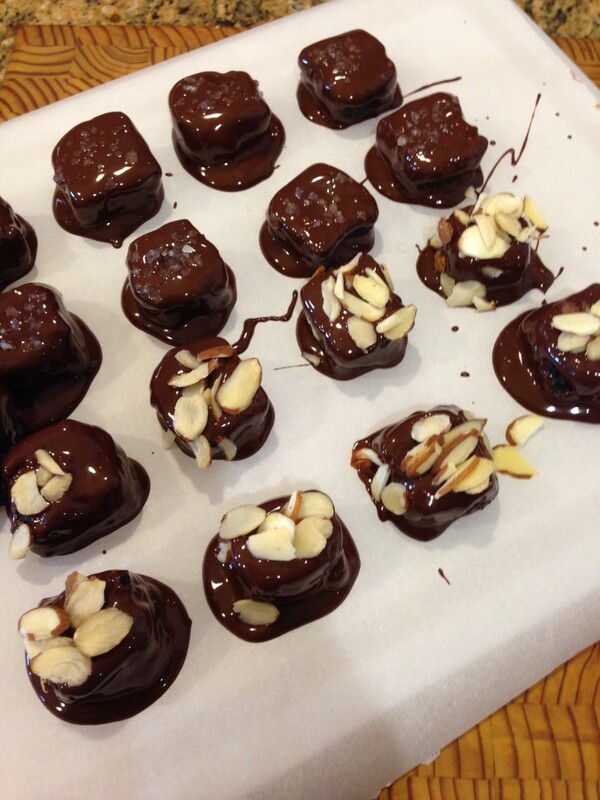 Sprinkle with sea salt or sliced almonds before the chocolate sets. You make me want a food processor even more, hehe. Chocolates and apricots, two of my most favorite foods= WINNING! Agreed! Such a great combination – little salt on the top too….heaven! I love this sweet treat. These are great for a buffet, or just because it’s time for snacks. I will definitely give these apricot bites a try. I want to give these a try all of my favorite ingredients are here. Apricots, chocolate, and nuts. Can’t go wrong there. Mostly definitely, these are just amazing Lois – thank you!